In this lesson, we will learn how to solve problems using Newton's first law. In the given figure, the body is at rest under the action of a system of forces. Given that the forces are measured in newtons, find the magnitudes of 𝐹 and 𝐾 . A car of mass 1.8 tonnes is moving at a constant speed on a horizontal road. If the resistance to the motion is 57.6 kg-wt per tonne of the car’s mass, find the force of its motor. A body was moving uniformly under the effect of three forces ⃑ 𝐹 1 , ⃑ 𝐹 2 , and ⃑ 𝐹 3 . Given that ⃑ 𝐹 = 7 ⃑ 𝑖 1 and ⃑ 𝐹 = 8 ⃑ 𝑗 2 , where ⃑ 𝑖 and ⃑ 𝑗 are orthogonal unit vectors, determine ⃑ 𝐹 3 which ensures that it will move at a constant velocity. A body was descending vertically in a liquid such that it was covering equal distances in each consecutive time interval of equal length. Given that the weight of the body was 55 kg-wt, find the magnitude of the resistive force of the liquid acting against the motion of the body. In the figure, the body is moving at a constant velocity 𝑣 under the action of a system of forces. Given that the forces are measured in newtons, find the magnitudes of 𝐹 and 𝐾 . In the given figure, the body is subject to the action of a system of forces. 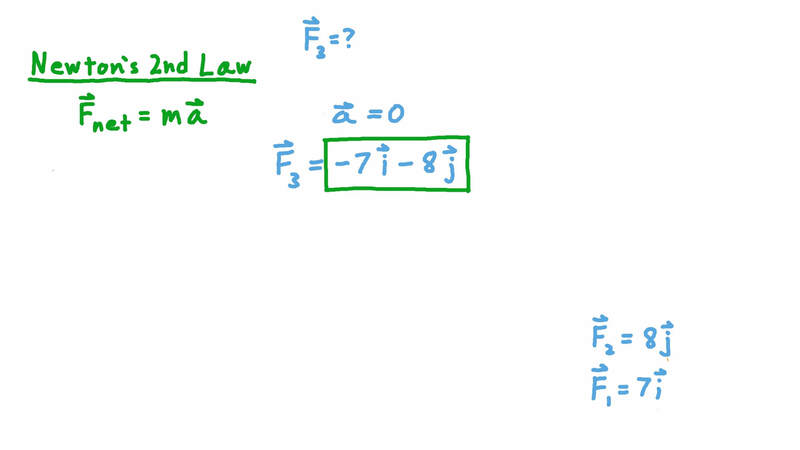 Given that it is moving at a constant speed 𝑣 and that the forces are measured in newtons, find 𝐹 and 𝐾 . Two forces ⃑ 𝐹 1 and ⃑ 𝐹 2 are acting on a body of mass 2 kg on a horizontal plane. The forces are given by ⃑ 𝐹 = 9 ⃑ 𝑖 − 1 0 ⃑ 𝑗 1 k g - w t and ⃑ 𝐹 = 2 ⃑ 𝑖 + 5 ⃑ 𝑗 2 k g - w t where ⃑ 𝑖 and ⃑ 𝑗 are unit vectors. One of them is a direction in the horizontal plane, and the other is the upward perpendicular direction to that plane. Determine the normal reaction of the plane ⃑ 𝑁 and the resistance force vector ⃑ 𝑅 , given that the body is moving at a uniform velocity. A body weighing 𝑊 is placed on a plane inclined at an angle 𝜃 to the horizontal, where t a n 𝜃 = 5 1 2 . A force ⃑ 𝐹 =  2 9 ⃑ 𝑖 + 5 ⃑ 𝑗  N is acting on the body, where ⃑ 𝑖 and ⃑ 𝑗 are two perpendicular unit vectors where ⃑ 𝑖 is in the direction of the line of greatest slope up the plane, and ⃑ 𝑗 is the upward perpendicular to ⃑ 𝑖 . Given that the action of this force makes the body move uniformly up the plane against its resistive force of 9 N, find the weight of the body 𝑊 and the normal reaction of the plane ⃑ 𝑅 . A particle of mass 𝑚 moves under the effect of the two forces ⃑ 𝐹 = − 8 ⃑ 𝑖 − 4 ⃑ 𝑗 1 and ⃑ 𝐹 = 2 ⃑ 𝑖 − 8 ⃑ 𝑗 2 , where ⃑ 𝑖 and ⃑ 𝑗 are two perpendicular unit vectors. Find the additional force ⃑ 𝐹 3 needed to act on the particle to make it move uniformly. A body is moving in a straight line at a constant velocity under the action of a system of forces ⃑ 𝐹 1 , ⃑ 𝐹 2 , and ⃑ 𝐹 3 . If ⃑ 𝐹 = 𝑎 ⃑ 𝑖 − ⃑ 𝑗 − 5 ⃑ 𝑘 1 , ⃑ 𝐹 = − 4 ⃑ 𝑖 + 𝑏 ⃑ 𝑗 − 3 ⃑ 𝑘 2 , and ⃑ 𝐹 = ⃑ 𝑖 + 6 ⃑ 𝑗 + 𝑐 ⃑ 𝑘 3 , find 𝑎 , 𝑏 , and 𝑐 . A car of mass 1.5 tonnes was moving along a straight horizontal road. When the car was moving at 78 km/h, the resistance to the car’s movement was 90 kg-wt for each tonne of the car’s mass. Given that the resistance to the car’s motion is directly proportional to the magnitude of the car’s speed and that the maximum force that can be generated by its motor is 360 kg-wt, find the maximum speed of the car on this road. A train of mass 50 tonnes has an engine whose maximum driving force is 9 000 kg-wt. Given that the resistance to its motion due to friction is directly proportional to the square of its speed and that this resistance was 20 kg-wt for each tonne of the train’s mass when its speed was 75 km/h, find the maximum speed of the train. A soldier jumped out of a plane with a parachute. After he had opened his parachute, the resistance to his movement was directly proportional to the cube of his speed. When his speed was 19 km/h, the resistance to his motion was 1 2 7 of the combined weight of him and his parachute. Determine the maximum speed of his descent. When its engine supplies a force of 506 kg-wt, a car of mass 912 kg moves with constant velocity up a hill of inclination 𝜃 . If the total resistance to the car’s motion is 1 6 of its weight, what is the angle of inclination, 𝜃 ? Give your answer to the nearest minute. The mass of a locomotive was 57 tonnes and the force of its engine was 1 755 kg-wt. A number of carriages were attached to the locomotive, and then the whole train descended a section of track inclined to the horizontal at an angle whose sine is 1 1 0 0 . Given that the mass of each carriage is 6 tonnes, the resistance to the train’s motion was 25 kg-wt per tonne of its mass, and that it descended at a constant speed, determine the number of carriages attached to the locomotive. When a man was skydiving, the air resistance was directly proportional to the square of his velocity. When his velocity was 37.5 km/h, the resistance to his motion was 2 5 1 6 of the combined weight of him and his parachute. Determine his terminal velocity (the maximum velocity of his descent). A body of mass 20 kg is pulled along a horizontal plane by a rope that makes an angle 𝜃 with the plane, where t a n 𝜃 = 5 1 2 . When the tension in the rope is 91 N, the body moves with uniform velocity. Find the total resistance to the motion, 𝐹 , and the normal reaction, 𝑅 . Use 𝑔 = 9 . 8 / m s 2 . A body of mass 20 kg was being pulled up a plane inclined at an angle 𝜃 to the horizontal by a force of magnitude 245 N which was acting up the line of greatest slope of the plane. As a result, the body was moving up the plane at a constant speed against a resistive force 𝑅 . When the force was reduced to 39.2 N, the body moved down the plane at a constant speed. Given that the resistance of the plane to the body’s motion did not change, determine the angle 𝜃 to the nearest minute. Consider the acceleration due to gravity to be 9.8 m/s2. A body of mass 8 kg was being dragged across a horizontal surface by two strings. The two strings were making an angle of 9 0 ∘ with each other, and the tension in each string was 320 g-wt. Given that the body was moving uniformly, find the magnitude and direction of the plane’s resistance to its motion, denoted by 𝑟 and 𝜃 , respectively. A truck of mass 2.8 tonnes was loaded with 1.5 tonnes of stones and descended a road inclined at an angle to the horizontal, where . If the force generated by the engine of the car is 86 kg-wt and it was travelling at a constant speed, find the resistance to its motion per tonne of its mass. After the car had emptied the load it went back up the slope driving at a constant speed. Give that the resistance per tonne of its mass on his ascent was the same as on his descent, find the force generated by the engine. A body of mass 1.3 kg was placed on a smooth plane inclined at 6 0 ∘ to the horizontal. A force of 62 N was acting on the body along the line of greatest slope of the plane in the upward direction. Find the magnitude of the reaction of the plane. Take 𝑔 = 9 . 8 / m s 2 .